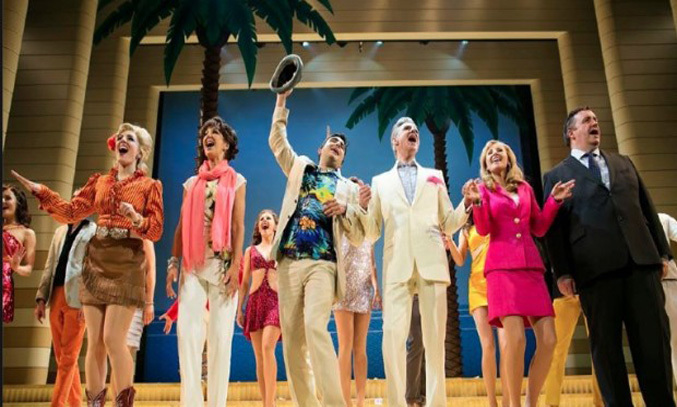 Smooth, slick and fabulously funny, Dirty Rotten Scoundrels is rip-roaring musical that is a real delight to watch. David Yazbek and Jeffrey Lane have done a fantastic job of adapting the classic film into a clever, dynamic and comic musical. The songs are catchy, the script is witty, the choreography is slick and the cast are superb. Michael Praed is amusing as vain and arrogant Lawrence Jameson who cons rich women out of their cash by pretending to be a prince. While he may not be as smooth or as charismatic as Robert Lindsay, he’s certainly suave, sophisticated and nifty mover who’s more than capable of captivating an audience. Noel Sullivan is equally superb as brash young pretender Freddy Benson. His chemistry with Pred is infectious, particularly during the numbers All About Ruprecht and Ruffhousin’ Mit Shuffhausen, where you get the feeling that the actors are really having fun. Carley Stenson stars as the American heiress Christine Colgate, the glamourous blonde who has a secret of her own. The former Hollyoaks star arguably has the best voice of the bunch and her duet of Love Is My Legs with Sullivan is one of the highlights of the show. The best scenes however belong to Mark Benton as Lawrence’s sidekick Andre Thibault. The actor certainly has a flare for comic delivery and he deploys it with devastating effect at key moments throughout the show. The scene wears a hedge on his head and his dance routine with Muriel Eubanks (Geraldine Fiztgerald) where he shows off his strictly moves are particularly hilarious. The all-star cast are supported by a first-class ensemble. Phoebe Coupe’s superb performance as Jolene Oakes is particularly worth a mention, as is Emma Caffrey’s brief but hilarious performance as the Usherette who bursts into song in the stalls, adding to the fun and humour of the piece. Peter McKintosh’s stunning set and costume design is second to none, transforming each scene with style, flare and panache without detracting from the action. Jerry Mitchell’s direction and choreography is equally superb, combining slick staging with equal parts hilarity. Dynamic, quick-witted and seriously funny, Dirty Rotten Scoundrels is one of the best musicals to grace the stage in a long time. Catch it while you can, you won’t be disappointed!